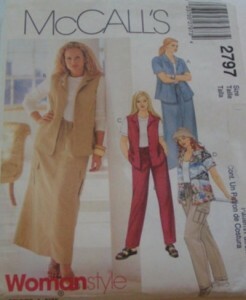 The McCalls pattern 2797 is one of my all-time favourites. I have made it up several times and you can check out the various incarnations on my blog. A few weeks ago, I purchased 2 metres of this delightful print cotton from New Threads, Weyhill Fair just about the same day that it was delivered to them. Because I was not sure about shrinkage I overlocked the edges and then put the fabric through the wash before cutting out the pattern. I decided to use the TNT blouse pattern and taking inspiration from a.n.other version of the blouse would repeat the double top-stitching around the collar, breast pockets, front facing and turn back cuffs on the sleeve hems. The only alteration that I have made is to reduce the front facing. Originally the instructions are to cut another complete centre front panel. As I felt this would be too much fabric on the front of the blouse, especially when combined with the breast pockets, I drafted a facing. For the short sleeves, when cutting out as I got closer to the end of the length of fabric I saw that I could add 4 inches to the length and this would be sufficient to provide for a turn-back cuff – another opportunity for some double top-stitiching. The buttons came from my stash. I have been watching Craftsy.com and several lessons for industry techniques to use when dressmaking. The lessons given by Janet Pray showed me some new techniques and methods that I have not tried before. Recently, when stitching a circle I have sewn from the inside rather than slide the item over the free arm of the machine. I have found this especially helpful when making the Cross Body Bags when you get to the stage of attaching the lining to the outer bag. So this time, when inserting the sleeves into the armholes I decided to try the method again, i.e. having the sleeve (which is the fuller of the two pieces to be sewn together) against the feed dogs to allow them to ease the fullness, whilst I can ensure that the stitching from the bodice side is an even and a regular curve. With only a few pins this new method worked beautifully first time. No nips, tucks or stitches in the wrong place, just a neat seam with the fullness evenly spread around the sleeve cap. I shall certainly use this method again for setting in sleeves. The remainder of the blouse went together quickly and easily though of course, the double topstitching did add to the time taken to complete the blouse. I am very pleased with the completed blouse which goes well with the Navy linen-look cotton wraparound skirt mentioned in a previous blog post. 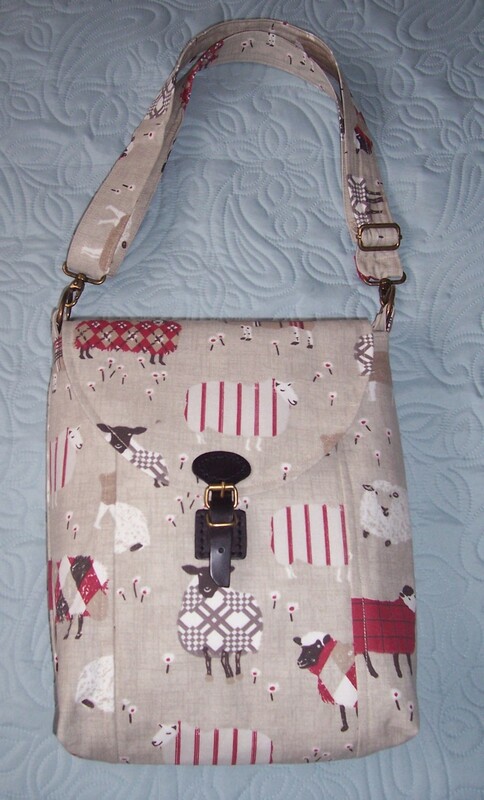 As promised, using some of the leftover 100% wool fabric from the Vogue coat and McCalls waistcoat I have this afternoon made a co-ordinating bag. It is the usual CBB but with a small change to the dimensions. In order to make full use of the remnants I reduced the length of the main pieces from 14 inches to 12 inches. 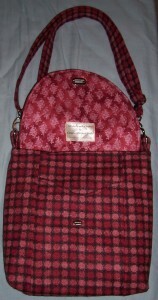 The outer pockets were also reduced in size to retain the correct proportions. 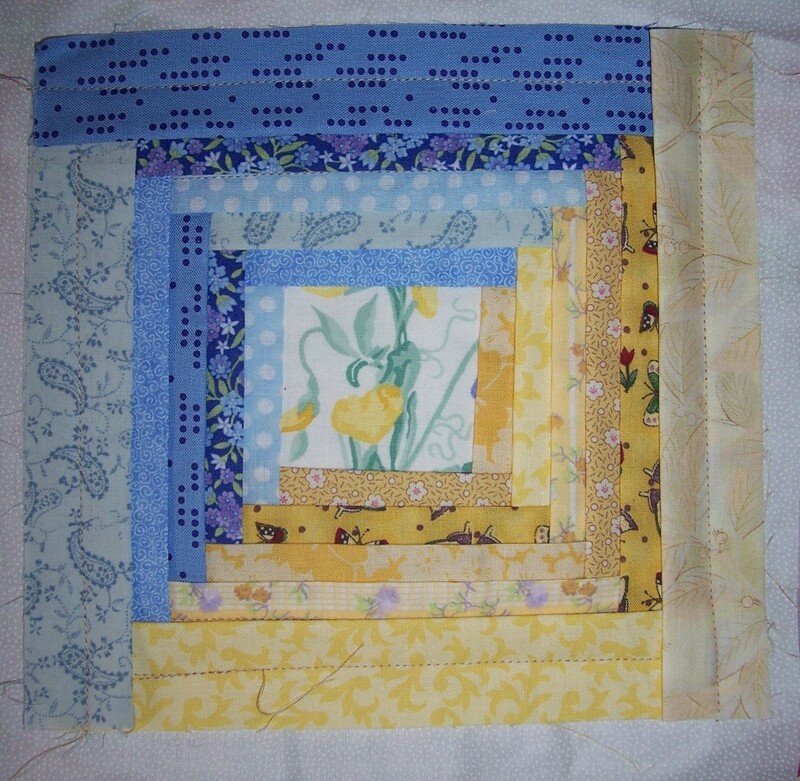 The fusible wadding inside the flap was a patchwork of pieces so I took the opportunity to quilt in a diamond pattern to retain them in place. For the lining I used part of a one metre cut length of a lovely co-ordinating cotton print that was on sale for just £3.50, purchased from Franklins, Salisbury The outer pocket zip fastener in Black which has an additional ring pull came from the stash left by my father from the days when he worked as an Engineer at the Optilon zip factory in Kent. The Dusky Rose zip on the internal pocket came from the same source. 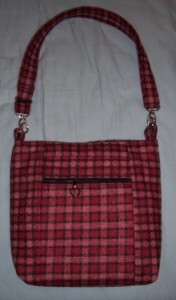 I was able to make the adjustable strap from a single length of fabric which has a finished width of a bare 1 inch. I used 25mm nickel hardware – a strap adjuster, two x Rectangles, 2 x swivel clip hooks and a twist lock. And would you believe it? There is still some fabric left – at present I have no idea what it will become! This pattern dates back to the early 2000’s and I have made it up in blouse form many times. 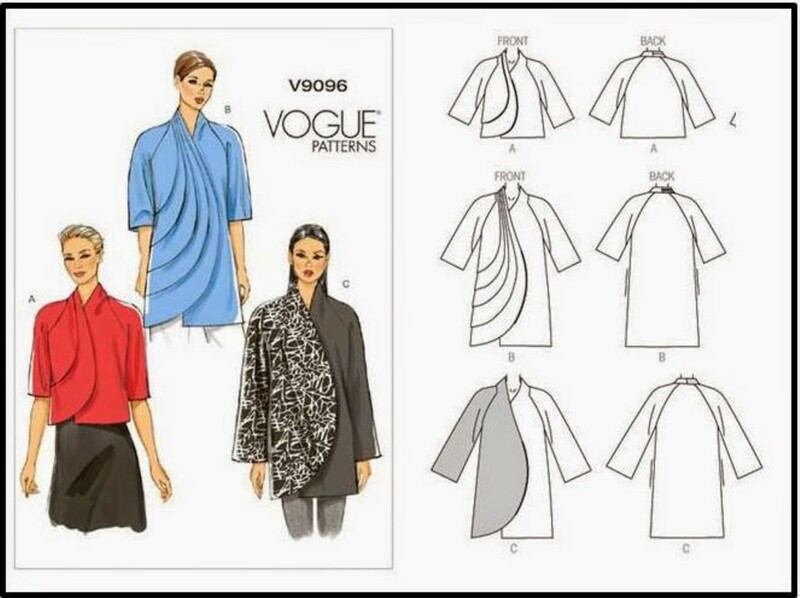 It is also the basic blouse pattern for which I draft new collars – mostly using the shawl collar from McCalls 6438 which I have featured elsewhere on my blog. As you can see from the above photo of the pattern envelope it really is well-used and I have therefore ordered a new copy from etsy.com. Having completed the Vogue 9096 coat I had a great deal of fabric remaining and so decided to make a waistcoat using view C of the McCalls 2797 pattern. 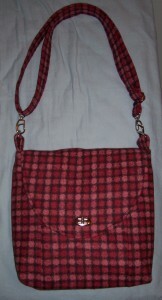 This time I would sew the garment with the “right” side facing out, i.e., the “spots”. 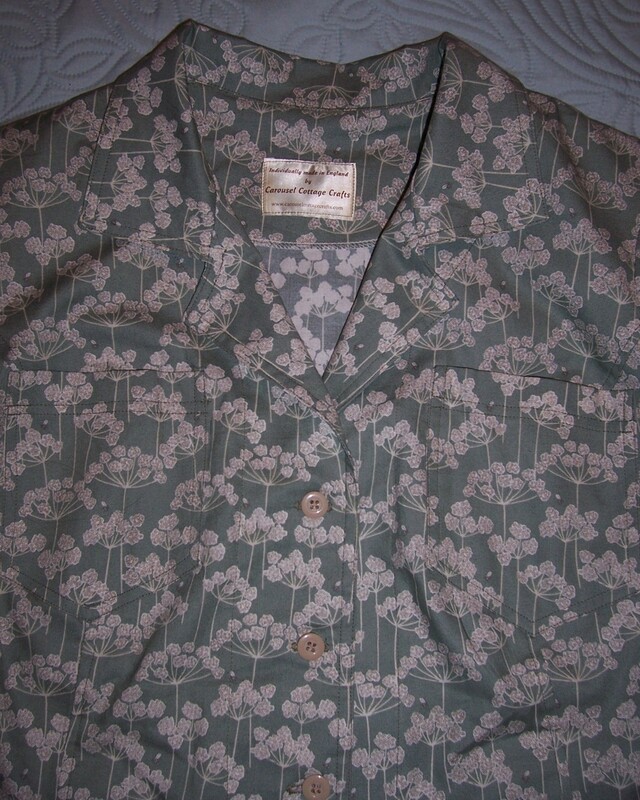 I would use a contrast Black Satin from my stash for the shawl collar and line with some of the anti-static lining purchased from New Threads, Weyhill Fair. I re-drafted the collar/facing and also the front pattern pieces to accommodate a lining. Utilising as many of the odd-shaped remnants as possible (easier when the garment has princess seamlines and is panelled) but at the same time taking care to match the weave pattern of spots, I cut out the wool fabric for the waistcoat. I used Vilene 401 weft insertion fusible interfacing for the collar/facing and also across the back bodice as this is my “go to” method for speed tailoring. The waistcoat went together really easily and quickly, so quickly infact that I fitted and stitched the side seams before remembering that as the waistcoat was to be lined I should have left them open! 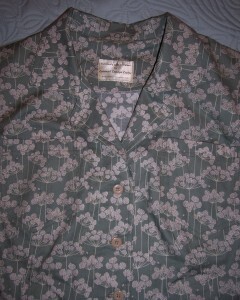 I pressed on with lining the garment by stitching the outer and lining together all around the outer edge. I was then left with the raw edges of the armholes in the wool fabric and the lining. I stay stitched both fabrics 5/8 inch from the raw edge, clipped the curves and then tacked them together by hand. 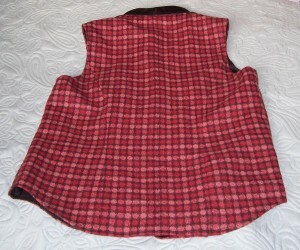 To finish the garment I used my trusty twin-needle to top stitch around the entire waistcoat. 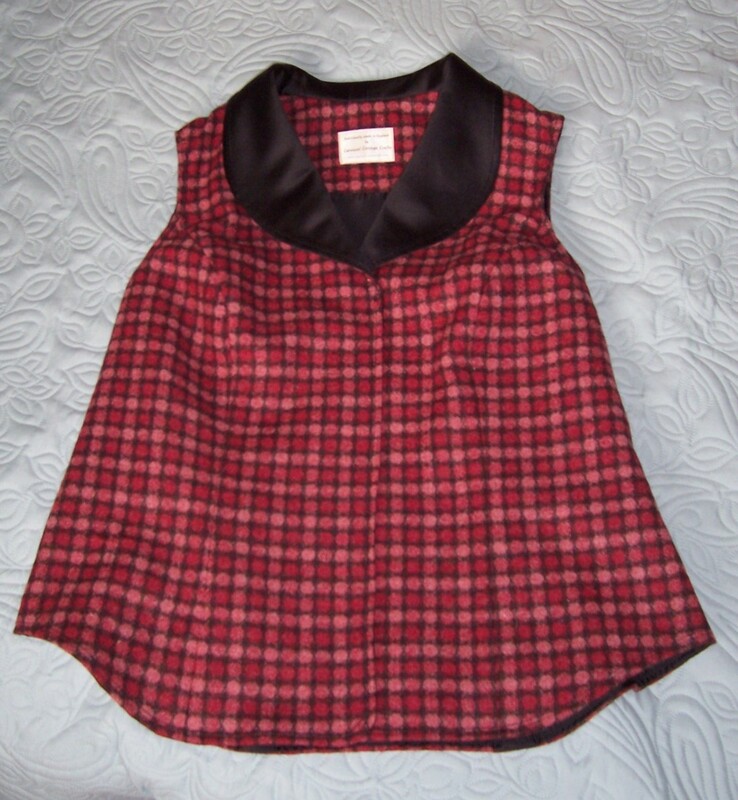 I started at the centre back hem, along and up the front bodice then stopped at the roll line of the collar. I switched the side from which I was sewing and stitched around the shawl collar to the other roll line before switching sides again to finish the other bodice front around to the centre back hem. I then twin-needle top-stitched the armholes to complete the waistcoat. As I am in the process of losing some weight prior to surgery, I shall leave the buttons and buttonholes until later, meantime I am wearing the waistcoat “edge-to-edge” style. There is still some fabric left from these two projects – sufficient to make another Cross Body Bag! I love that shawl collar waistcoat! Guess who will have to buy the pattern! 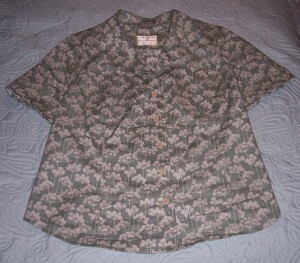 When the Vogue patterns were on sale recently I fell for this pattern of a raglan sleeved loose-fitting coat. I had some beautiful pure wool in my stash that had been donated by a friend a few years ago and I thought that it would be ideal for the garment. I decided to make view C but without the strong contrasting right front. The fabric is labelled “Spots” but my husband and and I both preferred the “wrong” side which is checks so that is the side that I decided to use. I cut out the Large size which is for a 16-18 as in the past I have found Vogue patterns tend to come up on the large side and as I have narrow shoulders compared to the rest of me I did not want to be swamped by the coat. I took care to match the checks as it is a particular “foible” of mine that it is most important to match the design when using checks. As I thought the sharp corner on the hem edge of the left front was jarring, (you can carry asymetry too far) I curved it to match the curve on the right front. Although it is not included in the instructions, I used Weft Insertion Vilene ref no 401 fusible interfacing on all the pieces of wool fabric. This gives substance to the garment, a longer “life expectancy” and helps to provide a professional finish. 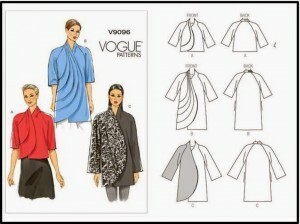 The lining is a copy of the fashion fabric pattern pieces and the jacket is then lined edge-to-edge. This does not provide any room for ease in the lining such as a pleat at the centre back. As I believe that I will be wearing the jacket sometimes whilst driving it is essential to provide for movement in the shoulder, upper back and arms. When cutting out the lining fabric I therefore incorporated a pleat in the centre back and also in the length of the sleeves. Like Goldilocks and the three bears, to add some structure and definition to the edge-to-edge finishing I auditioned some piping from my stash. First I tried some “thick” piping covered in Black Satin, that was too bulky so I removed the piping cord to give a flat bias trim. Still not right. Then I tried ready-made narrow piping in Rusty Red, better, but the colour was not a sufficiently good match. Finally, I covered the ready-made piping with the Black Satin bias – just right. I made the piping and basted to the entire outside edge of the coat. Around the neckline/collar, down one front, across the back hemline and up the other front before re-joining at the centre back of the collar. I stitched the lining together with the adaptations mentioned above and then attached to the jacket in accordance to the instructions, leaving a gap in the back hemline to facilitate turning through to the right side. I tried another fitting with the raglan shoulder pads installed and checked the length of the sleeves. I turned up a 2 inch hem on the wool fabric and having reduced the sleeve linings by 2 inches. A big sigh! All along whilst sewing the jacket I had thought that the shaping of the shoulders might be a problem and I was right. The silhouette was very 80’s – talk about power dressing – I looked like and American football player! There was nothing for it but to make an alteration! Those of you that know me also know that I detest alterations and having to make one on a garment that was so near completion is a real pain. I unstitched the hem lining and removed the shoulder pad, restitched a new shoulder seam by shaving off approximately ¾ inch before returning to the original seamline. 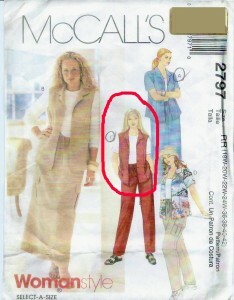 Now there was no need for a shoulder pad to fill out the excess fabric and the jacket silhouette though no perfect was more in proportion rather than an upside down triangle. 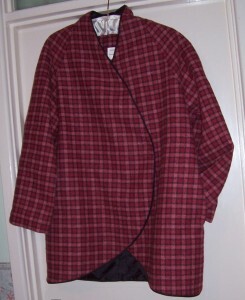 A final press, stitched the hem on the sleeves, closed the gap in the centre back hemline where I had turned the coat through and the garment was completed. At present, like the pattern there is no closure but that may well change at some stage in the future. When I tutored the workshop last weekend I also took along a prepared set of pattern pieces to demonstrate the making of the bag. As it happened I did not use my “demo” bag but used one of the student’s bags instead. As a break from sewing the lined wool coat which is needing some fairly radical alteration, I decided to construct the “demonstration” bag which I could then use over the next few weeks until I have completed a version in faux leather. 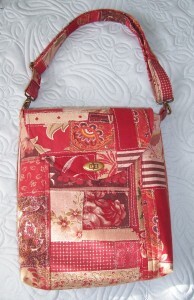 The fabric was purchased from B & R Textiles Ltd in Salisbury. I purchased just ½ metre of this wide-width printed linen-like fabric knowing that for some of the elements I would use lining fabric and thus reduce the thickness at some of the seam junctions. I fell in love with the design and so bought an additional ½ metre of the same design but with a Blue background which I think will co-ordinate well when wearing denim clothing. The construction of the bag was plain-sailing the only differences being that this time I used two large circular rings in the strap tabs instead of D-rings and a different fastener on the flap. It is a leather strap in two parts with decorative buckle over a magnetic snap. The fastener was hand-stitched as the holes were pre-made and I did not want to use the sewing machine with a possibility of missing the holes. 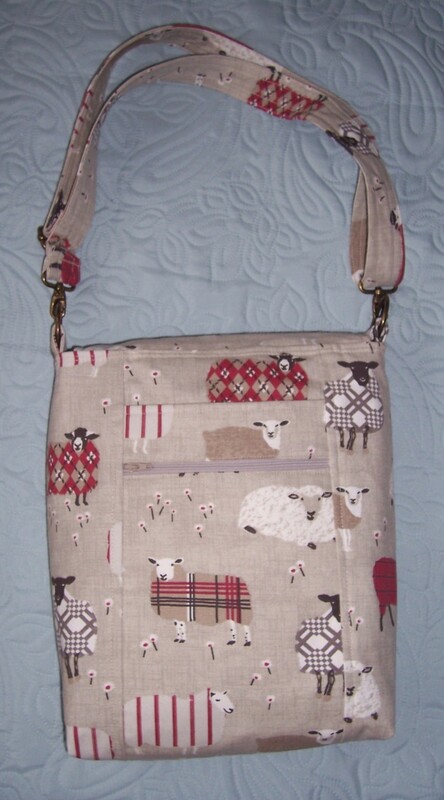 Once again, I am pleased with the resulting bag and have now swapped it for the “Chickens” bag which can be”cooped up” for a while. Since my last post I have been sewing but it has been a little bit of this and a little bit of that whilst at the same time endeavouring to complete a short coat using Vogue V9096 and some beautiful 100% wool fabric donated by a friend. 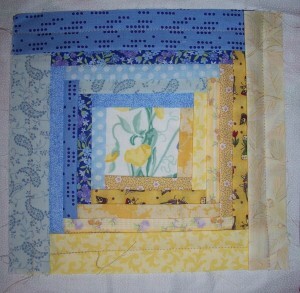 Attending the Monday patchwork group at Franklins we made some folded log cabin. I thoroughly enjoyed that project using a variety of printed cottons in yellow and blue, a favourite combination of mine. I am not sure of the final incarnation this project will take but meantime, here is a photo of folded log cabin so far. At the Thursday evening Sprat & Winkle meeting we made small patchwork drawstring bags. This project I DID manage to complete. The bag is fully lined and the method for the casing for the drawstrings was an unusual feature that I have not encountered before. 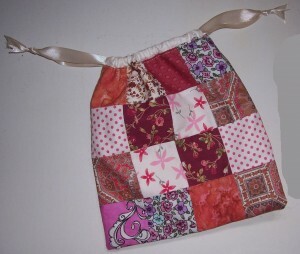 I am sure that I will make more of these bags for holding Christmas gifts. Now that we are in the second half of October I plan to spend some time putting together DIY gifts to go in the bags! 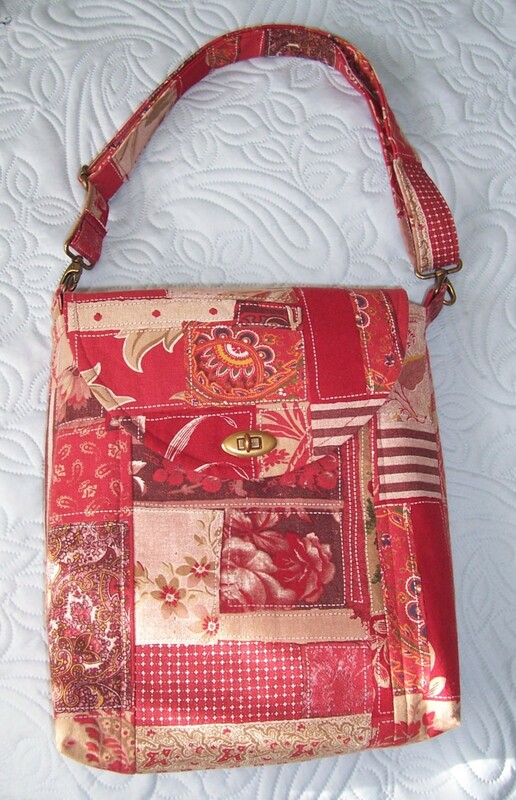 Over the weekend I tutored my second workshop making the fantastic Cross Body Bag from Deby Coles. There were six ladies gathered together at New Threads, Weyhill Fairground. 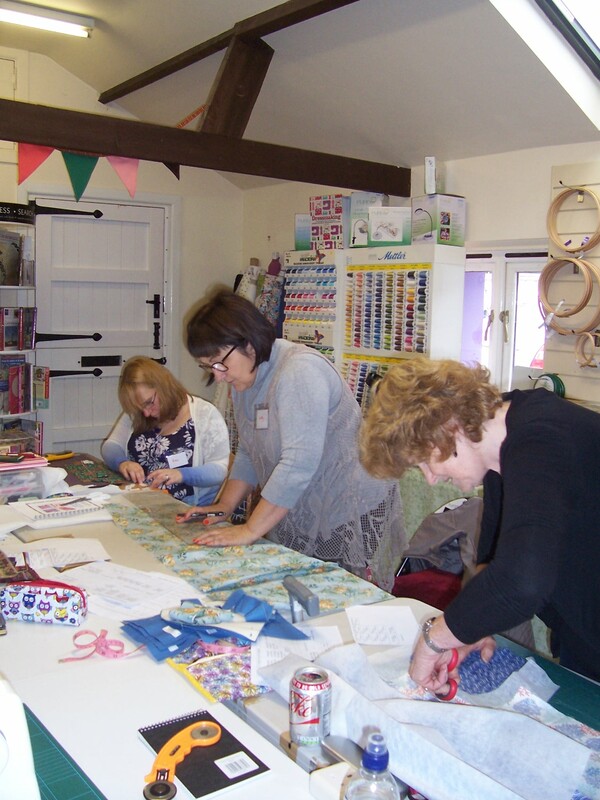 I am always delighted to see the range of prints and fabrics that can be used to make the CBB – it has such versatility and can be made in virtually any fabric from quilting cotton, linen, denim, needle cord, wool, tweed, oilcloth and even faux leather. 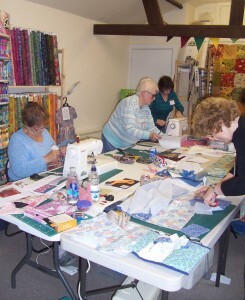 I hope that the ladies all enjoyed their day and will be pleased with their finished bags. The Ladies Busy at New Threads – making NEW BAGS!! Mo’s Bag – the first to be finished! You may recall an earlier post when I made a wrap around skirt for myself using camouflage fabric purchased from New Threads, Weyhill. That incarnation was a “Tester” to see how I got on with drafting the pattern from a grid diagram and enlarging same from a size 16 to a ?X! After several pieces of “finessing”, I arrived at a well-fitting skirt pattern. Having re-drawn the pattern including all those little adjustments onto fresh paper, I decided to proceed with a second skirt. I used a linen-look cotton purchased from Fabricland in Salisbury. I laid out the pattern pieces onto the 45 inch wide fabric and noted that because of the wide width of the skirt at the hem line they did not fit. I had already drafted a dart in the back so opened this up and at the same time folded out the width at the hem until the pattern fitted the width of the fabric. For the front I identified midway between the side and the centre front. I then slashed a dart and again folded out the fullness from the hem which at the same time enlarged the dart. I am hoping that this technique for reducing fullness at the hem will work. In any event it will be a “learning experience”! The overlocker was threaded up with White thread and as this fabric definitely requires some sort of finish to the raw edges I decided to use Hong Kong binding. I cannot remember the last time I used this technique thus it was a good idea to re-visit. I cut the bias strips ¾ inch wide from a pretty blue floral printed cotton and finished the raw edges of all the side seams of the skirt, i.e. two side seams on the back plus side seams and “leading edges” on each of the front panels before proceeding with the construction of the skirt. Once the side seams had been stitched the fit was fine-tuned again by making a seam in the centre back and taking out approximately 2½ inches, adjusting the darts slightly and re-cutting the “leading” edge of the overlap of the right front. 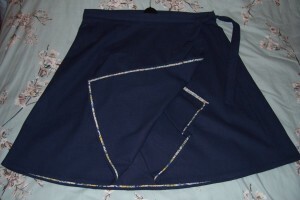 To do this I unpicked the left dart and cut a straight line through the centre of the dart down to the hemline. I restitched the hong kong finish to the “leading” edge and finished binding to the hemline. I pinned the hem plus the “leading edges” of the two front pieces. These were then stitched by hand with a fine hem stitch so that the stitches were almost invisible. 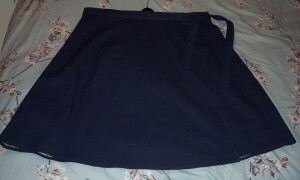 I hung the skirt up whilst I got on with the waistband and tie fastening. 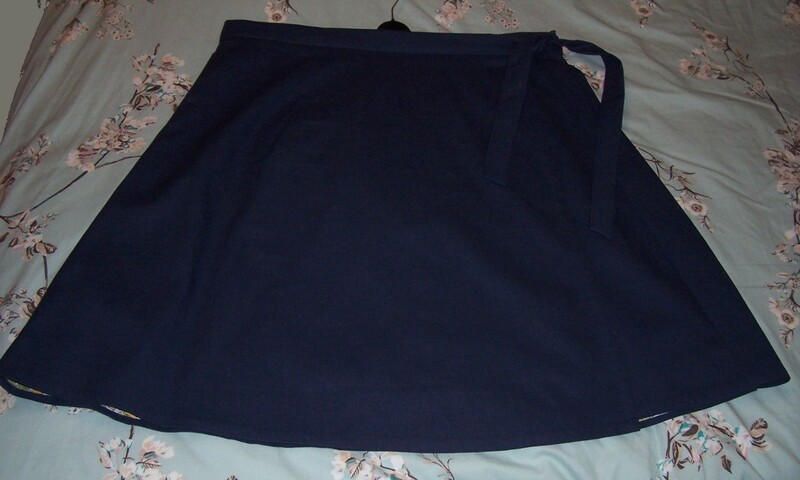 I used Vilene 220 fusible interfacing in the waistband which was cut from 3 widths of the fabric x 4inches wide. Having decided on the length of tie required to hang from the right front (overlap) I pinned the remainder of the waistband to the skirt. By auditioning the length of the waistband wraparound I ended up by cutting of an excess 10 inches or so from the original 3 fabric widths of waistband and tie. I stitched the short ends of the ties right sides together, then folded in ½ inch turnings before folding the band and ties in half and pinning before top stitching the ties and “stitched in the ditch” the waistband. Finally I machined a vertical buttonhole in the waistband just close to the side seam of the back right panel. The tie slips through the buttonhole from the left underlap and is then on the outside, goes around the back of the waist and is tied to the shorter tie extending from the right overlap. 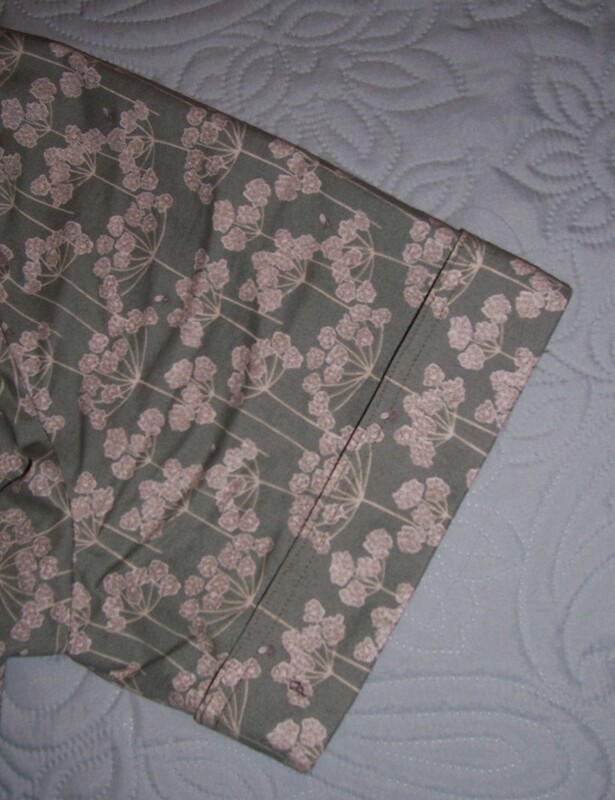 The photo below shows the overlap turned back to reveal the Hong Kong finish on the seams and hemline. I am very pleased with the result and think that I may well make this skirt again in another plain colour to co-ordinate with all my Autumn/Winter tops. If I can find a wide width fabric I will be able to make the skirt long enough to wear with boots and without exposing my knees!